Steph, Diane, and I are back from GenCon. We had a fantastic time out there at the “Best Four Days in Gaming.” Our thanks to everyone who stopped by the table. We had a great time meeting all of you, discussing comics, games, and all things nerdy. 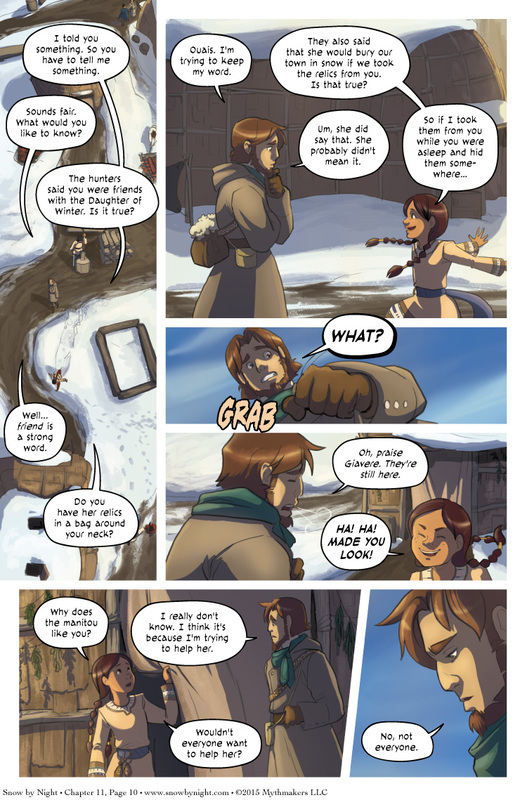 Toothy Kit questions Blaise on Chapter 11, Page 10 about the threats made by Snow-by-Night. Kit has her own unique take on it. Coming up, we meet Defiant Elk on the next page. To see a preview, please vote for Snow by Night on Top Web Comics. Hopefully she never follows through on that prank. There’s a lot of snow around here and it would be the likeliest hiding spot, till she materialized at least….